CA exams are considered as one of the toughest exams. CA Foundation level of CA course is assessed primarily by. And knowledge skill set. It is necessary for the student to understand the concept and theories to make the learning easy and interesting. “For the things we have to learn before we can do them, we learn by doing them”. Download ICAI applicable CA Foundation study material for May 2019. We assume students must have got a proper understanding of their syllabus when only one month is left in the commencement of exams. 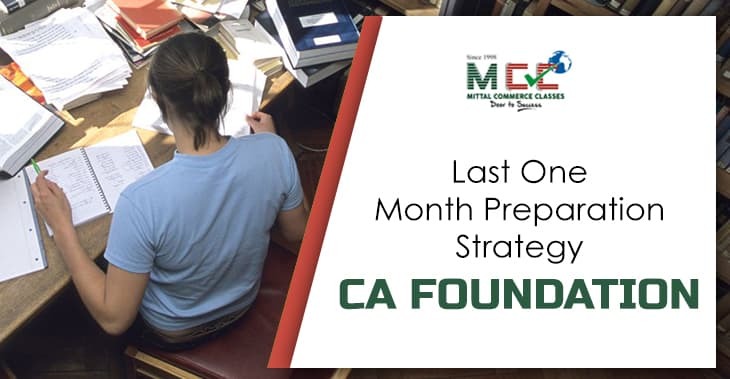 Please read our article on the 6-month preparation strategy for May 2019 CA foundation exams. Read your theoretical notes again properly. Keep yourself hydrated, drink lots of liquids. Keep practicing problems from Sample Papers and Mock Test Paper. Keep cue cards for ratio, formulas and rate slabs to be able to view when and wherever you want. Practice mock test paper of syllabus, you are least confident of. If you have understood whatever you have read, it will l be enough to execute it on your paper and score some marks.